Geek Pro rules are simple. Accomplish the most complicated of tasks in as few steps as possible; bonus points if you can do so without getting up from the couch. TeamViewer and LogMeIn are two remote management programs that allow you to access your computer.... well, remotely. Similar to Go to My PC, both of these services allow you to control your connected computer through any web browser. 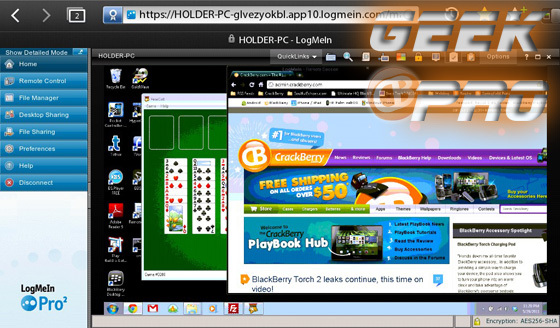 Unlike GtMPC, both TeamViewer and LogMeIn are completely free for non-commercial use. By now, you've probably figured it out. Your BlackBerry PlayBook is ready, willing, and able to use the web interface for both of these products. The web interface uses the client application already installed on your home or office computer to communicate using their respective websites. In your PlayBook's browser, you'll be able to control your computer almost exactly like you were sitting in front of it. You'll first need to register with one or more of the sites and install the client. This client will run on your computer at all times. Without it, you won't be able to remotely connect to your computer. Once you've signed in and accessed your computer, you'll be able to use your it as if you were sitting in front of it. You can open files and folders, move files around, and even email yourself that presentation you forgot this morning. All from your PlayBook's browser. There are only two issues - as I see it - with using the web interface on the BlackBerry PlayBook. You can't double-click, and there's no way to right-click. Double-clicking (double-tapping) in the flash interface toggles full-screen mode; thankfully, you can always touch and item and press return on the virtual keyboard to get the same effect. For the time being, the best way to right-click would involve installing a virtual keyboard on your computer. Certain keyboard combinations (such as Windows key - L) can't be done using the PlayBook's keyboard, but they generally can be done with menu commands on the website. I should also point out that the virtual keyboard does not seem to function when either web interface in is full screen mode. Swipe down from the top of the screen to exit the full screen mode when you need to type. Typing in the two web interfaces is not without its difficulties. 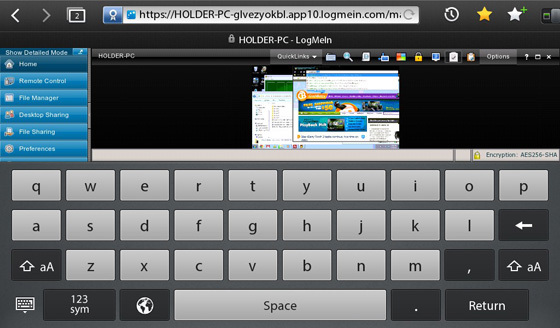 At the LogMeIn site, the window for the remote computer shrinks down to a tiny size whenever you use the keyboard. You'll have to close the keyboard to find out that CrackBerry.com is not spelled with a G. TeamViewer is not without its faults as well. With the keyboard open, the window remains the same size. But for whatever reason, capital letters and some punctuation doesn't translate; leaving you with a sentence that reads "go team111". For us Geek Pros, these are but trivial annoyances. The power of being able to remotely access your home or office computer from anywhere with WiFi far outweighs any detriment. Remote management offers so many different uses; though some are more geek-tastic than others. The other night, I wanted to watch a full-length video on the big TV. The video was on the PlayBook. Sure, I could have attached the microHDMI cable (Type D), but that's not geeky enough. 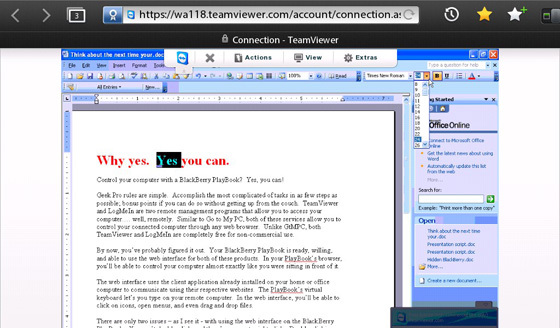 From the sofa, I logged into my TeamViewer account and accessed my computer. Over the wireless network, I transferred the file from the PlayBook to the PC. After waiting only a few minutes for the transfer (at nearly 3 megabytes/second), I started PS3 Media server and was watching my high-definition video a few moments later on the big screen. 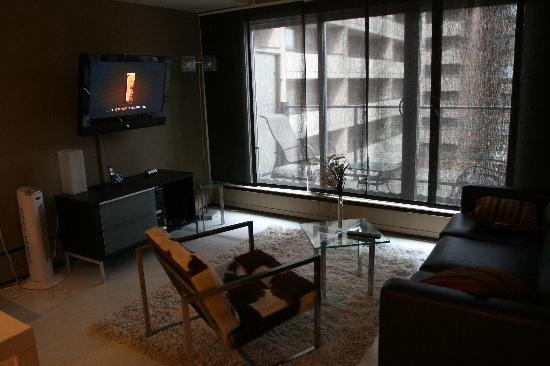 I never had to leave the couch. Bonus points; Geek Pro!